Wahl Aloe Soothe Shampoo is based on natural ingredients and contains no harmful detergents or cleansers. 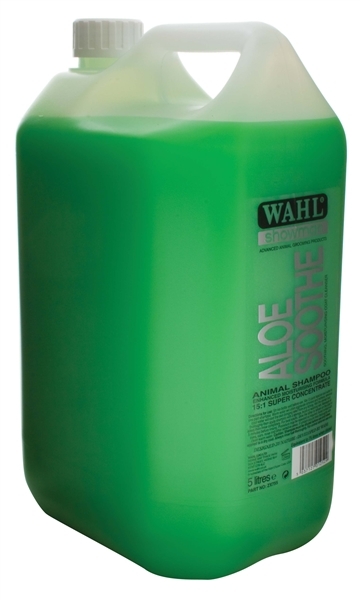 The perfectly balanced formula including Aloe Vera Gel to soothe and cool, Avocado and Coconut to moisturise and Wheat extract to deodorise, is designed to calm skin irritations as it cleans and lifts grease from the coat.For many years the Aloe plant has been used to relieve skin issues,this concentrated shampoo will gently remove dirt, grease, stains and odours, conditioning the skin as it cleans. Beneficial natural ingredients plus vitamins E and C, work with the Aloe to promote healthy, glossy results every time. Formulated to be effective with all animal hair types including horses, dogs, cattle, goats, llama, alpaca, rabbits and ferrets, Aloe Soothe Shampoo rinses out easily leaving the coat clean, soft and manageable with a fresh, pleasing fragrance.